This page is for the 2012 re-release. 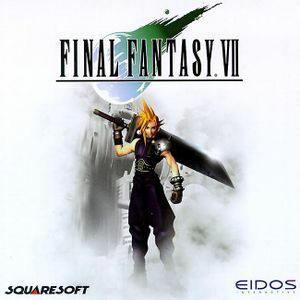 For the original 1998 version, see Final Fantasy VII. This is a re-release of the 1998 PC port of the PlayStation version updated with compatibility for modern operating systems along with additional new features. Frame rate is capped at 30 FPS, 15 FPS during combat and FMVs. 60FPS BATTLES mostly alleviates the combat situation. All post-2012 versions require Steam DRM. Since 2013 no longer comes with 3x install limit SecuROM DRM that the releases in 2012 had. Contact Square Enix for a replacement if you got the 2012 non-Steam version. A fan-made mod pack with a host of tweaks and fixes. Note that "MENU OVERHAUL", which is no longer supported in newer versions of The Reunion, does not apply to this version of the game and has never worked on it. Instead, Steam users have "MENU ENHANCEMENT". BEACAUSE: In-game text translation fixes. MENU ENHANCEMENT: Updates menus to look neater. WEAPON: Adjusts various aspects of the game's difficulty to be smoother. MODEL OVERHAUL: Improves in-game character models. SOLDIER QUEST: "99 1:35 Soldiers will be hidden throughout the world as collectables." MEMORY PATCHES: Various memory patches, such as cheats et al.. The Remako HD Graphics Mod is a mod that completely revamps the pre-rendered backgrounds. All of the backgrounds now have 4 times the resolution of the original. Using AI neural networks, this upscaling tries to emulate the detail the original renders would have had. There is no way to use this mod without losing achievements, cloud saves and the trainer. How to enable cloud saving. 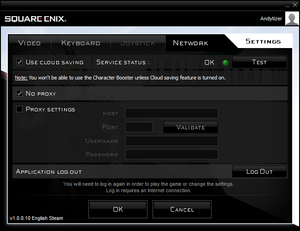 Cloud saves sync through the launcher using Square Enix's cloud service. 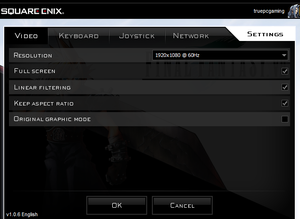 Final Fantasy VII (2012) video settings menu. Displays in 4:3, or stretches to widescreen. Menu screens are capped at 60 FPS, combat and FMVs are capped at 15 FPS, and everything else is capped at 30 FPS. Use The Reunion for 60 FPS combat. Launcher lacks controller navigation support. Supports DirectInput device. The four directions are mapped to X and Y axes. Lacks support for POV hat, D-pad, and Triggers on standard XInput controllers. The entire game pauses when put in the background. ↑ 1.0 1.1 File/folder structure within this directory reflects the path(s) listed for Windows and/or Steam game data (use Wine regedit to access Windows registry paths). Games with Steam Cloud support may store data in ~/.steam/steam/userdata/<user-id>/39140/ in addition to or instead of this directory. The app ID (39140) may differ in some cases. Treat backslashes as forward slashes. See the glossary page for details. Character Booster, which increases HP, MP and Gil levels to maximum. Cloud save game functionality (but no Steam Cloud support). This page was last edited on 7 April 2019, at 12:12.